From the vast, frostbitten landscape of Finland, there is a significant list of heavy and extreme bands; a lot of Black Metal is from that area of the world and its closest neighbours, but this is my first introduction to Melodic Rock from Finland. 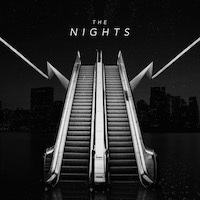 From Helsinki, THE NIGHTS, a sort of Power Pop, Rock band; and they have released their debut self-titled album via Italian label Frontiers Music. “Welcome to the Show” is the opening track; it has a catchy, rocking beat; and a heavy guitar groove that still has warmth to it; the vocals have a somewhat ‘youthful’ delivery, which climb and dance over the chord progression of the song. Then “Nothing But Love” flexes to life with a quick, heavy riff, and huge bounce in the beat; and the vocals do pretty much the same thing from the previous song, with minor changes. The next track “Juliette” has a strong guide from the keyboards; it also has kind of an 80’s Pop Rock feel to it and the rather mediocre excitement I had for this album slows another gear; all of the glint and glaze of the production, just isn’t catchy I’m sorry to say. My already damped enthusiasm isn’t helped by the next track “I Will Never Stop Loving You”; which is a ballad that is about as musically cliché as this genre can get. I will own up straight away and gladly admit that I am an enormous advocate of Nu Metal and all the associated bands that are within ear shot of that subgenre; I will even go so far as to say, that one of my guilty pleasures is a love of Pop music as well, but THE NIGHTS don’t really hit the mark. Look, the instruments and song writing on this are top notch, there is some good heaviness, and some really catchy grooves and chord progressions; but the biggest failing here is the vocals. I’m sorry to say, but the singer really needed to put a bit more angst in his voice in a lot of moments here, but he didn’t; and a lot of the lyrics are really bland and cheesy, like, “I Wanna Be Your Superhero”, which I think is border line childish. It seems to me that this is a very ‘producer driven’ band of compliant musicians, which is a fairly blatant cash grab at chart success. And you know what, I’ll bet they do and make out like bandits. No offense to the members of this band, but I am very indifferent about the music on this album; the production here is chart topping quality, but the songs lack substance.